Measles is coming back. According to the Courier Mail, since August 16 people have contracted it in southeast Queensland, and the Chief Health Officer is writing to families of unvaccinated children urging them to get their children vaccinated. A boy came back from overseas recently with measles, and yesterday there were radio warnings for people who had been at Movieworld – Movieworld! – on 2 October to go to their doctors if they felt ill. I had measles when I was 6 or so, and trust me, you will feel ill. For nearly 2 weeks, I lay in a darkened room because my eyes hurt so – measles causes blindness – and the rash, the high temperature and general disability made me utterly dependent on my very non-non-working mother to nurse me through it. I also remember going back to school, and having trouble catching up – in geography they had ‘done’ Continents and Peninsulas while I was away, and I gave up geography soon afterwards. I wasn’t here for the polio epidemic that hit southeast Queensland in the early 1950s, but I had a friend with a withered arm from the disease they still called ‘infantile paralysis’. Another friend remembered how she had a friend for a sleepover, who was diagnosed a few days later with polio. Her mother stripped her room of everything – sheets, bedding, clothes, rugs, toys – and burnt them in the backyard. She doesn’t remember what happened to her friend. What she remembers was her toys piled on the bonfire, and the terror in her mother’s eyes. I was lucky. In 1955 the Salk vaccine, based on the dead poliovirus, was introduced, and we all lined up at school for our jabs. A few years later we were tested for tuberculosis. At my school, we were all negative and got another jab, but in suburbs with high concentrations of post-war refugees, many children tested positive. The same was true, oddly, for schools in dairying areas, where children were exposed to brucellosis, a related disease, while milking cows. Nelson Mandela got tuberculosis on Robben Island, and TB is coming back, especially in American prisons. This strain is antibiotic-resistant. The word vaccination comes from the Latin vacca, a cow, and vaccination was first applied to smallpox. The idea of deliberately infecting children with a mild dose of smallpox originated in Asia and reached Europe from the Ottoman Empire in the early 18th century. Since tomorrow is Ada Lovelace Day, let it be noted that it was a woman, Lady Mary Wortley Montagu, the wife of the British Ambassador in Constantinople, who introduced the innoculation into England. Smallpox killed both rich and poor, and scarred those who survived, but a controlled, mild dose gave lifetime protection. It was a risk – some children died – but it seemed a risk worth taking to people who knew what smallpox could do. Then in 1796 Edward Jenner, a country doctor, discovered that cowpox (or vaccine pox) gave protection against the much more deadly smallpox, and a safe form of vaccination was born. 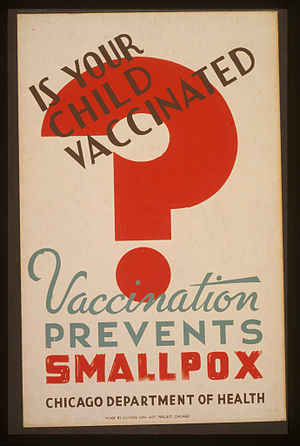 I was vaccinated in the 1950s, because although smallpox had gone from Australia, you still needed it to travel overseas. As a baby I also had the standard jabs against diphtheria, whooping cough and scarlet fever, all killers in their day, and still sharp memories to my parents’ generation. I was luckier than them. I still went down with chicken pox and mumps. Mumps is such a silly name that it is hard to take it seriously, but a friend nearly died from encephalitis caused by mumps, and a complication left my father profoundly deaf in one ear at 12. However I’m lucky – again – because it can also cause male infertility! Oddly I missed rubella, despite the fact that every time a girl at our school caught it, her mother would host a ‘German measles’ party with the aim of spreading the disease as widely as possible. Rubella is not a killer, but in a pregnant woman, it can cause terrible damage to her unborn child, and of course our destiny was motherhood. As a result of all these common under-rated childhood diseases, my late-1940s generation invariably had occasional absences from school, and interrupted growth spurts. This may partly explain why later generations are now taller. It possibly explains why we read more books. Debate about childhood immunisation rages on. There are plenty of scientists to argue the case that we need it. When the level of immunity is high, one or two non-compliant families don’t much matter, but if the level drops below about 90 percent (the current level of measles compliance in Queensland) there are enough unprotected people in the population to create an epidemic. How many unvaccinated children and teenagers were at Movieworld on 2 October? Scientists deal in numbers and statistics; historians deal in memory and stories. We need both to alert people to the dangers of diseases returning. We think of measles as a childhood illness, and so it is, where it is endemic in the population. I got it very young. My parents got it when they were children, so had immunity when they needed to care for me. But when a disease arrives somewhere new, or somewhere where two generations have no immunity any more, it hits the whole community. There is no one to care for the sick, or tend the crops, or keep the economy ticking over. Nobody knows to keep the blinds drawn (measles) or to bathe the sores in calamine lotion (chicken pox) or avoid pregnant women (rubella). In 1874 Britain annexed Fiji. The next year, the two young sons of the chief Cakobau came to Sydney on a visit. Somewhere during the visit, one of the boys picked up measles, and because his return to Fiji was fast, on a new steamship, he was still infectious when he got home. There are no census figures for 1870s Fiji, but during the next 2 years, at a guestimate, about a quarter of the population died from measles. It was a killer – and potentially it still is. This entry was posted in australian history, european history, medical history, personal and self-indulgent and tagged Ada Lovelace Day, Fiji, Lady Mary Wortley Montagu, measles, mumps, Rubella, smallpox, tuberculosis, Vaccination. Bookmark the permalink. Hi, Marion, a couple more for your list. The ‘Spanish flu’ influenza killed many in Brisbane c. 1919-1920. My mother used to tell of looking through holes in the galvanised fence at the Exhibition Grounds and seeing the dead bodies piled up as gravediggers were affected as well. The Enever family, well-known bakers in Fortitude Valley, had something like twelve members affected by the illness. Another epidemic was the gastro-enteritis outbreak in the late 1940s. My young sister spent three months in isolation at the Royal Brisbane Hospital before clearance. Thanks Ross. The difference is that we don’t have a vaccine against gastro or influenza, so we haven’t become complacent about them, the way we have about diseases that have disappeared (for the present). Interesting post Marion! Our family is still very mindful of the need for vaccinations and the awful consequences of some of these diseases because we still have a couple of members whose lives have been significantly affected by polio. You are right though, as a population we are forgetting and hence vaccination rates are plummetting. Coincidentally The Guardian has published a map of Australia showing the percentages of fully immunised children in each statistical area. Interesting results. Thanks Yvonne. That are interesting, all right. A few real hot spots for low levels – and often in urban areas where education levels are high. Troubling. Thanks, Lisa. Yes, it would make a good TV documentary series – if someone is listening?